Cabling is the use of hardware to support trees or branches that are defective or weak but that the tree owner does not wish to remove. 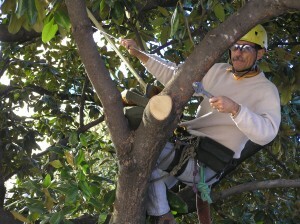 Sometimes weak limbs are retained because removing them would be very stressful on the tree. Cables are also sometimes used to keep healthy limbs from settling lower over time with gravity. 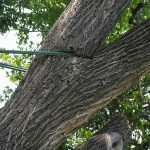 Defects could include a cavity or decay, a weak connection between two branches or inadequate branch strength. It is critical for a property owner to realize that such defects make the risk of limb or tree failure higher, even when cabled, and that complete removal of the weak part is safer than cabling, especially if the consequences of failure are severe. There are many cabling techniques out there, but only a few meet industry standards, which are fairly detailed. A few things you can look for to determine if a cable was properly installed include making sure the cable and any hardware used are all along a single axis. Cables that are at an angle to the connecting hardware are not properly installed (with rare exceptions). Connective hardware, when used, is usually an eyebolt or eye lag. These should not be hardware store variety, but what is called “drop forged” and galvanized steel. The difference is that with the cheaper stuff, the steel is shiny, and the eye is formed by bending the steel into a loop. A small gap is visible where the steel meets itself. Using such hardware on larger cable installations almost guarantees failure. With drop forged steel, the eye is solidly formed. The galvanized metal is greyish and not shiny. For limbs larger than about 8 inches in diameter, eyebolts which pass entirely through the tree and have a nut and washer on the end should be used, rather than eye lags, which screw part way into the tree. Lags are less injurious, but don’t have the holding power. On soft wooded species, lags should not be used at all. 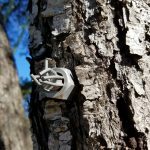 Bolts and lags are both installed by drilling into the tree. Another key to proper installation is the use of “thimbles”. These are tear-drop shaped metal shields that go inside the eye created when the cable is attached to the eyebolt to protect the cable from wear. They are absolutely mandatory, and visible from the ground. Another acceptable technique involves passing the cable itself through a hole drilled through the tree. It is secured with special pieces of hardware made for this purpose. This allows a smaller hole to be used than that needed for an eyebolt, and there is less hardware to be at risk of breaking (photo). nutrients up and down the tree or branch, and weakening it physically. Some non-metal cabling systems are intended to be wrapped around the trunk, supposedly expanding with the tree as it grows. These systems are used more in Europe than here, but have become more common in the states. I have seen trees on historic properties in France that were badly damaged by these systems. Plus, they are susceptible to damage from UV light and rodents. All this and they only cost twice as much! There’s a lot more to know about proper cable installation, but these are a few tips you can use to spot a bad one. Obviously you’ll be far better off choosing a competent arborist to begin with. See my posts on that subject.